The Dog Geek: Happy Birthday to Zip and The Dog Geek! Today is a very special day here at The Dog Geek, because this is Zip and this blog's third birthday! 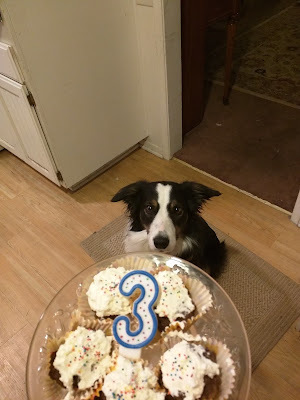 Though Zip the border collie entered the picture long after I started the blog, she was born on the same day I made my first post. That was March 3rd, 2014, making today Zip's golden birthday. Happy birthday Zip! I started The Dog Geek as Brisbane's Bark Blog, focusing almost entirely on my most amazing dog. Along the way, we fostered some dogs, added Sisci Godzilla, moved houses, changed jobs, and spent a lot of time with friends. A little over a year ago, Brisbane was diagnosed with cancer. I decided to change the name of the blog for a few reasons, partly because I knew he wasn't going to be with me forever. Brisbane's Bark Blog became The Dog Geek in June 2016. Brisbane himself left us in August. Zip joined us in September. The blog continues, with near-daily updates and over 1,000 posts. The cast of characters has changed a bit, Ru is the only dog that started the blog with me. The setting is different, we no longer live a mile from the beach. We've picked up quite a few readers and a whole lot of dog gear in the last year, and I'm delighted to hear from all of you! This is Zip's first birthday with me, but she get a number cake picture anyway. It's kind of a tradition. She also got a new Zogoflex Air ball that's way too big to choke on. It's the first in what will eventually be an impressive collection of large-diameter balls. Keep an eye out for the review! Thanks for joining us for our bloggiversary!